Yes, Vienna unveils itself to the traveler. Sometimes the revelations are subtle—hardly revelations at all—and other times they slap you in the face and make you wonder what you were thinking before they slapped you. In my own experience, though, insight comes in a kind of cloudy middle ground: there are things to see, but you have to be expecting them to see them with any clarity. Two small buildings, then, in Vienna. The Sala Terrena and the Freud Museum. Two different kinds of pilgrimage brought us to two different places, and the results are some thoughts on "mythical realism" as well as the places themselves. The Freud Museum is a little further from the older city center, easy to find and clearly marked on the Berggasse. It has a simpler story, being the home of Freud's Vienna offices from 1891 until he left for London in 1938 under the specter of the approaching Nazis (this time Anschluss applies). 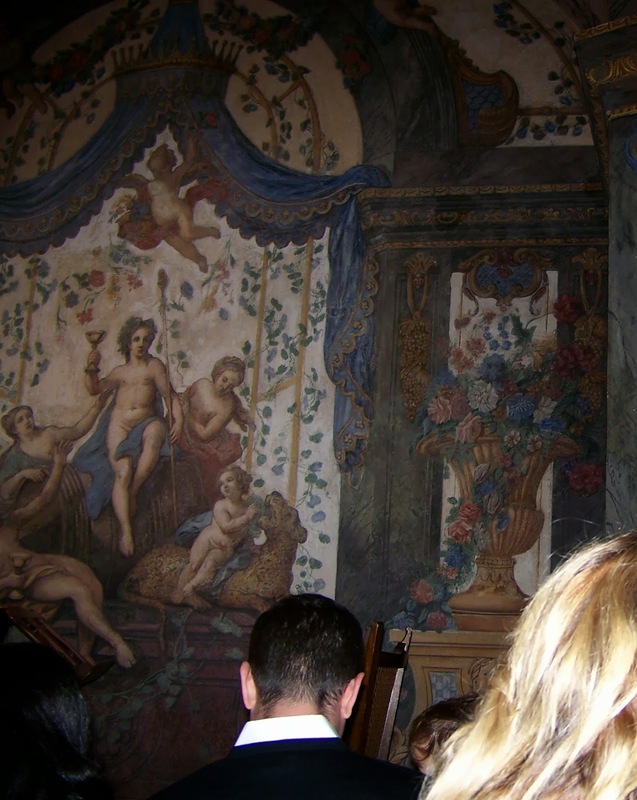 He wrote almost all of his major works while housed on Berggasse, and conducted his private practice from these rooms. You would think the places had little in common, and in many ways, you would not be wrong. The exuberant Venetian Renaissance excesses of the Sala Terrena contrast strikingly with Freud's now-spare, almost minimalist offices. 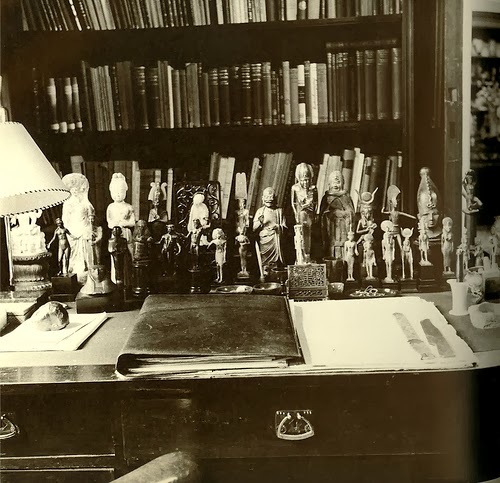 But compare my photograph (taken surreptitiously at the Sala, where photos were discouraged) and this old picture of Freud's desk as it appeared in the 1930s, taken by Hungarian photographer George Brassai. The old gods are impossible to shake. Nietzsche held that the gods were the shapes we gave to the blind, inscrutable forces of the Will. Jung wasn't really that far from reaching the same conclusions: for him, the gods were the shape we gave to large, irresistible forces in our subconscious—impulses, syndromes, psychological complexes (yes, I know Freud is probably spinning that I would bring in Jung to talk about his offices, but there you go!). In both cases, side by side with established orthodoxies—Dionysus dancing in the consecrated premises of the Sala Terrena, totems and statues of the gods on Freud's desk in his offices—the ancient figure underlie, critique and mock the religion du jour. The old gods persist, because they are the keepers of story, and story is a way (perhaps the way, but maybe that's just a writer talking) we define our theologies. In the chairs of the Sala Terrena, listening to Mozart's "Dissonanzen Quartett", or seated in Freud's waiting room amid the stripped-down monuments to the religion of the subconscious, mining the dissonances of our own souls, the gods watch us as we watch other things, and it's only now and then that we have a glimpse of how, in the very depths of ourselves, all these worlds connect.